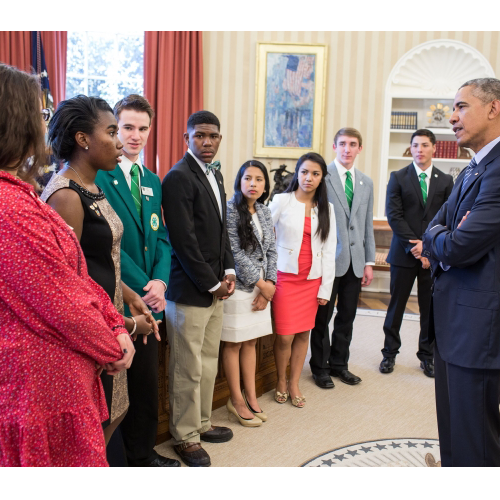 April 24, 2015 – Georgia youth Ka’Shawn Burke joined a delegation of eight 4-H youth for a meeting with President Barack Obama and U.S. Secretary of Agriculture Tom Vilsack at the White House on April 13, 2015. While there, the 4-H’ers engaged the president and secretary on the programs they are leading to improve their communities in healthy living, food security and STEM education. The youth were invited by Secretary Vilsack as part of the White House Rural Council’s ongoing effort to turn the tide against rural poverty. The council’s new effort, Rural Impact, addresses the challenge of rural child poverty by bringing together federal agencies and public and private resources. Each 4-H youth in the delegation has worked in their home state on programs to provide food, supplies and educational services to better equip families to fight childhood poverty. “President Obama and I met with eight members of the national 4-H community in the Oval Office. Each one of them had an inspiring story about how they are opening up new doors for kids in their hometowns, and how this work is building stronger communities where they can learn, play and grow,” said Secretary Vilsack in a blog he posted about the meeting. Burke was chosen to meet with the president because he has raised awareness by promoting healthy eating and physical activity to citizens in his community. Burke’s 4-H Healthy Living ambassador platform is childhood obesity. This was inspired by 4-H and his basic agriculture science and technology class. Burke is a 16-year-old sophomore who is active in ROTC, a cross-country runner, a 4-H Healthy Living youth ambassador, and is a member of the 4-H Robotics Club with Fort Valley State University. This meeting with President Obama continues a tradition started in the early 1900s. Since President William Taft, every sitting U.S. president has met with a delegation of 4-H youth at the White House. President Obama extends the streak as the sixteenth consecutive commander-in-chief to meet with 4-H’ers. National 4-H Council has been combating rural poverty with programs such as 4-H Food Smart Families, designed to combat childhood hunger by empowering families to make informed decisions when it comes to budgeting at the store and cooking healthful meals at home. Sponsored by ConAgra Foods Foundation and United Healthcare, this program helps vulnerable families through hands-on food experiences, teaching skills ranging from food budgeting to cooking, in order to enhance food knowledge and ultimately make mealtime less stressful. To join the conversation around Rural Impact, please use the hashtag #ServeRural. To learn more about 4-H Food Smart Families, please visit http://www.4-h.org/4hfoodsmartfamilies/. 4-H, the nation’s largest youth development organization, grows confident young people who are empowered for life today and prepared for career tomorrow. 4-H programs empower nearly six million young people across the U.S. through experiences that develop critical life skills.In the U.S., 4-H serves every county and parish through our network of 110 universities and more than 3000 local offices. Globally, 4-H collaborates with independent programs to empower one million youth in 50 countries. The research-backed 4-H experience includes a Caring Adult Relationship; a Hands-On, Skill-Building Project; and a Meaningful Leadership Opportunity – resulting in 4-H’ers who four times more likely to contribute to their communities; two times more likely to make healthier choices; two times more likely to be civically active; and two times more likely to participate in STEM programs. 4-H is led by a unique private-public partnership of universities, federal and local government agencies, foundations and professional associations. National 4-H Council is the private sector, non-profit partner of the Cooperative Extension System and 4-H National Headquarters located at the National Institute of Food and Agriculture (NIFA) within the United States Department of Agriculture (USDA). Learn more about 4-H at www.4-H.org, find us on Facebook at www.facebook.com/4-H and on Twitter at https://twitter.com/4H.